Vice President Leni Robredo asks the Supreme Court sitting as the Presidential Electoral Tribunal (PET) to trash the Bongbong Marcos’ motion. It seeks the dismissal of her counter-protest him. 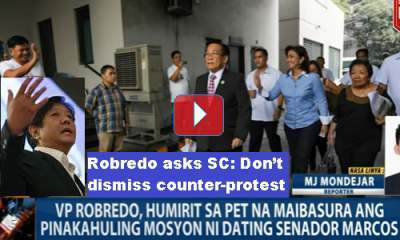 [VIDEO]: Vice President Leni Robredo wants Bongbong Marcos’ motion to dismiss her counter protest be stricken out from records. Lawyers Romulo Macalintal and Maria Bernadette Sardillo explain that Marcos wrongly cited previous rulings of the Supreme Court in the cases of Perla Garcia and Bienvenido William Lloren. This is in his bid to dismiss Robredo’s motion. They continue that Garcia’s case refers to the simultaneous payment to the House of Representatives Electoral Tribunal (HRET) for the petition filing. Lloren’s case is not applicable because it was about the payment of the appeal fee. Robredo’s camp accuses Marcos to resort to misleading the Tribunal with the use of the Supreme Court’s decision on Lloren’s case. Thereby, they urge the Motion to Dismiss the Counter-Protest. On top of that, they want PET to erase it from the records of the electoral protest, the motion said. They stress that Marcos’ motion is moot and academic. This is allegedly so because Robredo complies with the PET’s order last April 25. The payment of the first installment of the cash deposit for her counter-protest that amounts to P8 million was paid last May 2, 2017. Previous post: Robredo’s Greatest Excuse is No Budget for Projects but can’t she Raise Funds? not yet don’t be in a hurry as you still have to pay P7m+.